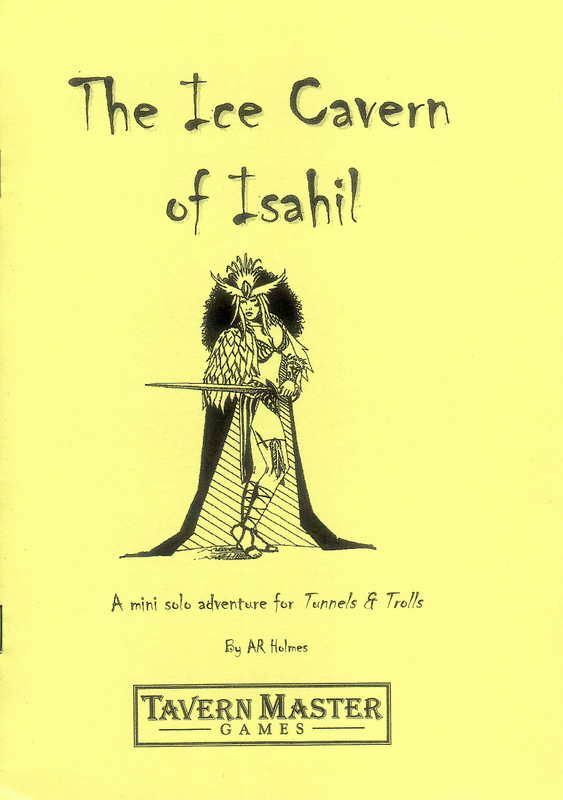 The Ice Cavern of Isahil is yet another solo module from classic T&T writer Andy Holmes. Andy kindly included both copies of the solo when I ordered it from Hobgoblin's Tavern (site is currently down) - the first edition and the reprint with a much nicer cover, bigger font size and better quality paper. As a mini solo it won't take you long to get through; that is if you survive of course. There is at least one place I can think of where you probably won't stand a chance, but it's possible to emerge alive. There is a nice part at the beginning in which you can absail down an icy crevasse into the cavern below. However, to do this you must pass 10 saves. This means even at the start of the module you could plummet to your death, similar to how in Halls of the Gorgon you can be killed even before you enter the dungeon. 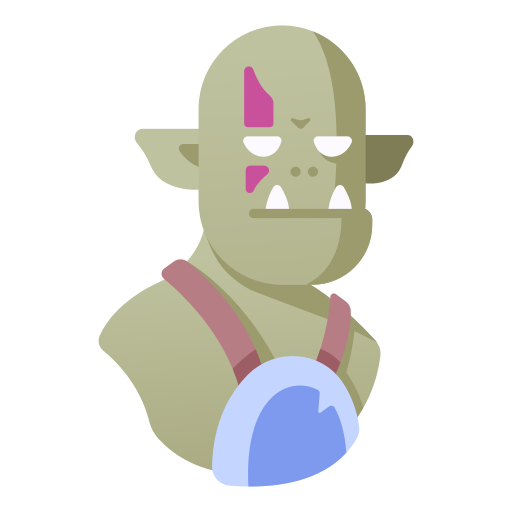 Monster-wise you're going to come up against some meaty ones, so prepare yourself in advance of the adventure. Disappointingley the random encounter table is only small but then again Holmes doesn't go crazy with the random encounter locations. Most of the time you have to roll a one to come across a beastie. The 'pre-programmed' encounters are really good, but don't expect a big showdown at the end unless you want it to happen. By far the best part of the module is what happens after you've slayed a room teeming with Ice Goblins. It's awesome, but I won't give it away. There's some nice treasure to be found in the cavern, including a deadly dagger that my dwarf warrior keeps strapped to his ankle. You probably don't want to take a fresh first level delver into the Ice Cavern unless you're feeling lucky. You can use 5th or 7.x rules pretty easily with the solo (I used my 5/7ed mashup). Overall, The Ice Cavern of Isahil is a good, if challenging mini solo adventure that makes up for its small amount of random encounters with it's excellent pre-programmed monsters and various hazards. I agree entirely with this review. It is a typical ARH mini in that it is very well written but very, very tough on low level characters. Once you've worked out that survival is unlikely you can just get on and enjoy. The opening hook in Ice Cavern presents the idea that a treasure lies at the bottom of a deep crevasse. How do we know a treasure is down there? A rumor? A legend? Some kernel of information acquired from a seer? No, no, and no. We know a treasure is down there because...well, we just know, we’re convinced of it. Huh? So, I’m to explore a crevasse out in the middle of a frozen wasteland and risk life and limb to find a treasure that I think might be down in the icy depths based on a ...feeling? That’s right, Gertrude. That’s a poor example of foreshadowing. Foreshadowing is supposed to be a hint, a teaser of what is to come. Instead, we get in the introduction bright, flashing lights that tells us where we’re going, with the added, “...you do not yet know of it.” Well, guess what? I do now. Also, taking a closer examination of that passage, notice the way it reads: “you do not yet know of it...” is better stated as “you don’t know it yet.” Also, better is leaving out the hedging word “may.” The passage, as it stands, is jerky, uneven, and awkward to read. Writing quality, which makes or breaks any mini-solo, short story, novel, article, etc. must be strong, engaging, engrossing for the reader. What we get in this mini-solo is bland writing that does little to excite the imagination, that is when it isn’t clunky, and awkward to read. What I like: There are a couple of encounters that are interesting, the gameplay’s okay, but it’s not enough to save an uninspired, poorly crafted (from a creative writing standpoint) adventure. Final observation: this critique may have sounded harsh. But I believe when you charge a price for a product a professional standard must be met. Ice Cavern of Isahil fails to do so. What I see a lot of in the T&T community is the desire to give accolades to any product that comes out, no matter how poor it may be. There are products out there where a price is being charged that clearly fail to meet any professional standard, yet high scores and praise are given to them for what...? Simply being a product for T&T. This attitude has to change in the community, for the game, for T&T. 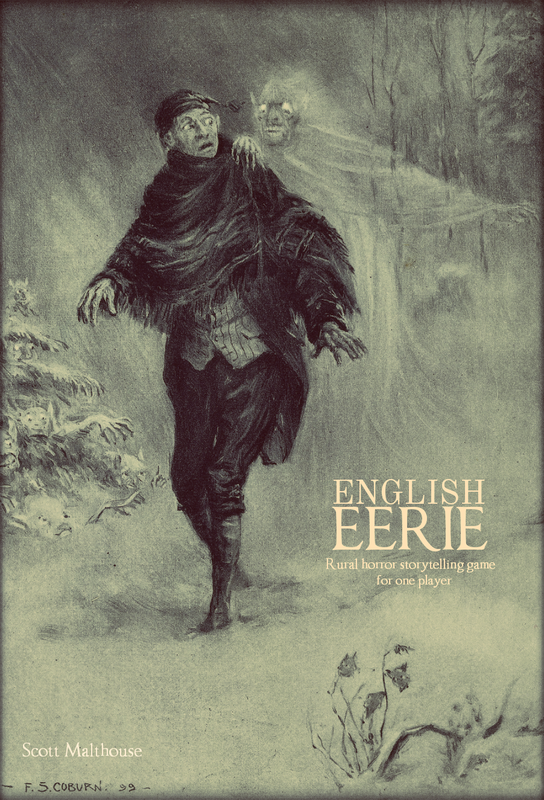 Is this the same adventure as "The Ice Cavern of Seralind" printed in the 6th edition rules? It sounds very similar. @Gaptooth No idea. Will have to look into it. Personally I think an adventure where you have to make 10 SR to get going is not praiseworthy. To say it in plain English, this is not a good adventure. IMNSHO.